Here are 5 tips to help you make a good summer routine with your kids, so both they and you have an enjoyable summer holiday from school. Everyone looks forward to the lazy days of summer, especially after the end of school rush. However, if you're not careful the kids being home for the summer isn't lazy and care free, but instead more exhausting and chaotic, because they're home all day long. 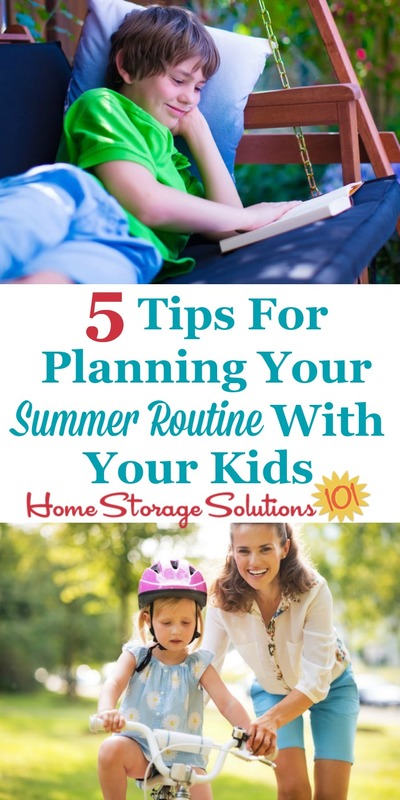 But summer can be an enjoyable time for everyone, parents and kids alike, if everyone gets into a summer routine that accommodates the needs of your household as well as plans for activities everyone can enjoy. 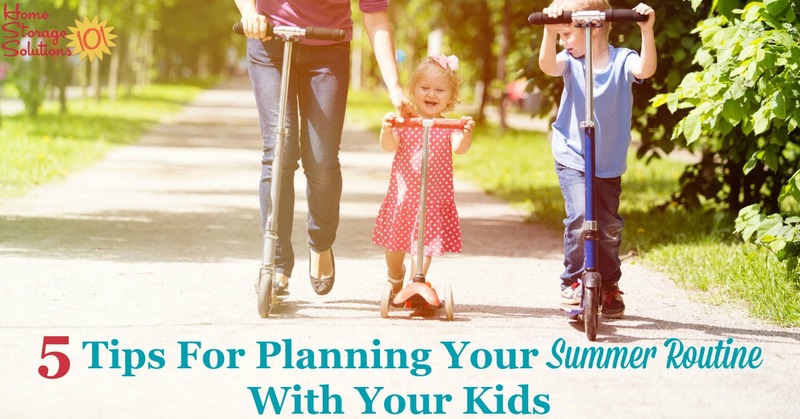 Below I've listed five factors to consider when planning out your family's summer routine so this precious time is all it can be, but nothing important in your life, or in your home, falls through the cracks. When you hear the idea of a summer routine you may first think of activity jam packed days and nights, and while a few of these types of days can be loads of fun, doing it constantly is exhausting. Your day-to-day summer routine is meant to make sure you've got time to get what you need to done, as well as make sure the kids have an enjoyable summer break. But don't exhaust yourself, or your kids. You won't stick to that kind of routine anyway, and no one will enjoy it long-term. Instead, allow the pace of summer to be slow. That's what we all enjoy about it in the first place. One of the facts of life is that even in the summer chores need to get done, like laundry, cleaning and tidying up, meal preparation, and more. To keep yourself from getting stressed out by a messy house or piles of unwashed laundry make sure your routine provides sufficient time for getting essential household chores done. Take a look at your current daily cleaning checklist and weekly cleaning schedule, as well as your laundry routine, and make sure you're giving yourself enough time to accomplish these tasks. Remember, with your kids at home it's also the perfect time to get them involved in doing some of those chores (or teaching them new household skills), even if they don't normally do them during the school year. Everyone's got to eat each day of the summer, just like the rest of the year. The difference during the summer is that kids eat all of their meals and snacks at home, unlike the school year where they eat some meals at school. Don't let this come as a surprise for you each day, but instead expand your meal planning to include those extra meals so you're never struggling for something to serve. You may already be used to fixing school lunches and snacks, and if so your routine just needs to shift some in the summer for serving those extra meals and snacks at home. If not, you'll need to make sure you carve out additional time for fixing more meals, as well as the time necessary for cleaning up the kitchen afterward. I've also personally found I need to spend more time grocery shopping, as well as budgeting for the fact that my grocery bill increases during the summer months. And just like with chores, getting your kids involved in meal planning and preparation is a great way to expand their life skill set during the summer months. While summer for your kids should include a lot of time for fun and games, that doesn't mean they can't learn things during the summer as well. Providing kids with a loose schedule and routine keeps them from being bored, getting into (too much) mischief, and allows you to plan fun activities for everyone. Take some trips to a local museum, run to the library to check out books for daily reading time, or watch an educational documentary in the evening. In addition, unlike during the school year, which can be quite busy with homework and after school activities, the long days of summer are a great time to teach your kids life skills they will need once they're out on their own. I already discussed, above, that summer is the perfect time to teach kids how to do household chores as well as getting them involved in meal preparation and cooking, but you can expand these lessons to anything you'd like for them to learn but hadn't gotten around to teaching them yet. Finally, make sure your summer routine makes time for you and your kids to get outside, and to enjoy play and physical exercise. I think that's what many of us really remember about summer -- playing for hours and hours outside in the backyard or in the neighborhood, or at the pool. If you get the essential household chores done, have planned to keep everyone fed, and haven't otherwise overscheduled everyone, there should be plenty of time to have some fun and enjoy the summertime. That's the whole point of a summer routine, after all! 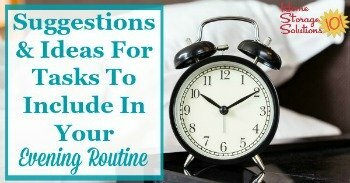 Here are quite a few ideas of the types of things you can include in your morning routine, plus a trick for how to more easily, and with less stress, get yourself and your family out the door each morning for school and work, by working backward when planning your mornings. 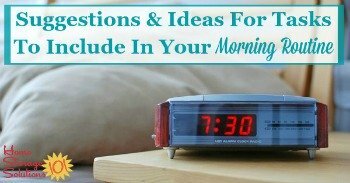 In addition, here's another article which provides suggestions and ideas for the types of activities you can do in the evenings to set yourself up for a great tomorrow. Finally, make sure you also make time to declutter this summer. 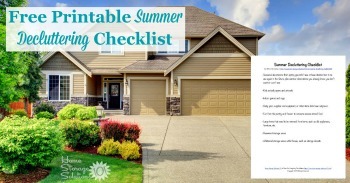 Use this printable summer decluttering checklist (which includes a free printable) for ideas of what types of clutter to get rid of.